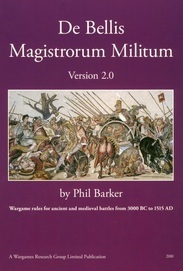 The rules to be used are DBMM version 2.1 and the army lists published in 2016. The Umpire will utilise any current official errata and clarifications. This will be in the form of the Commentary available on the DBMM website. The Umpires decision is final. Army lists must be submitted allocating all elements including baggage to a command. They must specify the number of ME and the disheartened/broken/shattered levels for each command and for the whole army. The list must indicate the climate, aggression factor, year, geographical region, generals where relevant, classification of general, all stratagems chosen (and the elements to which they apply, if appropriate) and all double based elements. Once an army list has been submitted it may not be changed or altered other than to correct any errors. Players may only correct their errors by making reasonable changes to their list. It is not allowed to completely re-write the list, and the list checkers decision on this is final. Any incorrect list discovered after a game has commenced (after “aggression” dice have been rolled) must be corrected prior to the next match. Players must supply their own terrain pieces, which must be to an acceptable standard. Additionally all figures must be representative and must be painted and based to an acceptable standard. Umpires will have the discretion to remove unsightly or unrepresentative items. Players must be present and ready to start all matches at the appointed time. Where a player has a reasonable excuse for arriving late the match start will be delayed by up to 30 minutes. After which time the effected player will be awarded a bye and maximum points. No player will be awarded more than one bye for any reason. If a player resigns from a game at any stage after the first “aggression” dice have been rolled their opponents will be awarded maximum points. Games will end immediately when the umpire calls time. if any combat dice has been rolled then all the remaining combats are resolved, if not proceed directly to the end of the bound and determine the status of all commands whether they are broken/disheartened etc. and then calculate the final scores. Army lists must be submitted for checking in advance and must be received by the List Checker not later than two weeks before the event. A penalty of 2 victory points per round, for each round of the competition (at any venue), may be imposed for late submission of lists. Any incorrect list discovered after a game has commenced (after aggression dice have been rolled) must be corrected prior to the next match. A modified Swiss Chess system will operate throughout the competition. Where possible players may not play against fellow club/team players in the first 2 rounds, nor players whom they have played in earlier rounds, nor against any relatives in the first degree of consanguinity. Thus a player cannot be matched against his/her spouse, parent, brother, sister, and/or child. For simplicity no game shall be deemed a civil war.